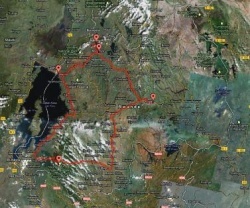 In February 2009 I visited Rwanda. I was on an East Africa safari trip, organized by Good Earth Tours, to visit Kenya, Tanzania, and Rwanda. Good Earth Tours is located in Tanzania, with an office in the USA. 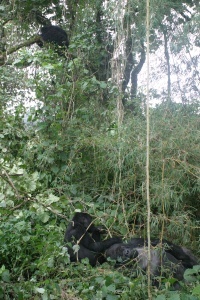 The local tour operator with which Good Earth Tours contracted in Rwanda was Amahoro Tours. The organization of my whole trip by Good Earth Tours was impeccable. Everything worked out perfectly, I was very happy. The local organizer in Rwanda worked out very well too. My flight from Arusha to Kigali was 4 hours late, but my guide/driver was waiting for me at the airport. Just like in Kenya and Tanzania, I was the only person in the tour. I had a guide, who also drove the car, just like Kenya and Tanzania. Just out of the airport, we stopped at a restaurant to get something to eat. While I was eating, my guide changed into safari clothes, and got the Toyota Landcruiser (he had picked me up in a regular Toyota). After getting gas and money for expenses from his office, we were on our way out of Kigali. He was concerned that I might not like driving at night, so he suggested changing the itinerary, but I said I was OK with driving at night. The reason he was concerned was evident later at night. There are LOTS of people walking on the road, even at night. And they are of course not lighted, which makes for difficult driving on completely unlighted roads. Our first destination was Nyungwe National Park, a 4 hour drive, to stay overnight in the Gisakura Guest House, just outside the park. Nyungwe National Park is located in the south of Rwanda, on the border to Burundi. The Gisakura Guest House was the only accommodation on my East Africa trip that was not first class. It was very basic, but there are no first class accommodations in that area. The bath room and shower was across the hall and didn't look very inviting at all. The restaurant there was mediocre at best as well. The service was lousy and the food was mediocre. In one of the restaurants, they brought paper napkins only on demand. Everywhere, the beer was warm, they put it in the refrigerator only on demand, which of course was too late. The next morning I had an early start to go Chimpanzee trekking, we left at 5:00 in the morning. It was a fascinating excursion. I was in the forest for about 4 hours, and watched the Chimpanzees for about an hour. Trekking through the dense forest, up and down steep slopes was quite difficult. After the Chimpanzees I booked another trek, this time to see the Ruwenzori Black-and-white Colobus Monkeys (Colobus angolensis ruwenzori, german: Angola-Stummelaffe, french: Guéréza d'Angola). This excursion was very easy, just a gentle walk through the tea plantations. In the afternoon it was back to the Gisakura Guest House, a different part this time, closer to the current location. These accommodations were even more basic, with no warm water, and a ripped-off, broken toilet seat. But at least the bathroom was in-suite, even though it was not any more usable than the one the previous night. Our next destination was Volcanoes National Park, in the north of Rwanda, on the border to Congo and Uganda. Fortunately, Rwanda is a small country, so it takes only about eight hours on dirt roads to drive from the southern border to the northern border. It is a nice drive along Lake Kivu, all through cultivated lands. I was scheduled to stay in the Gisenyi Serena Hotel, a first class hotel, about an hours drive from Volcanoes National Park, where I was going Mountain Gorilla trekking. Unfortunately, the president of Rwanda and his cabinet were on a retreat in that hotel, and we were refused access. That meant we had to continue on to Ruhengeri, where I stayed in the La Palme Hotel. It is a very nice hotel, but nowhere near the class of the Serena. This was the only time on my whole East Africa trip that something didn't go quite as planned, but it certainly wasn't any fault of the tour organizer. 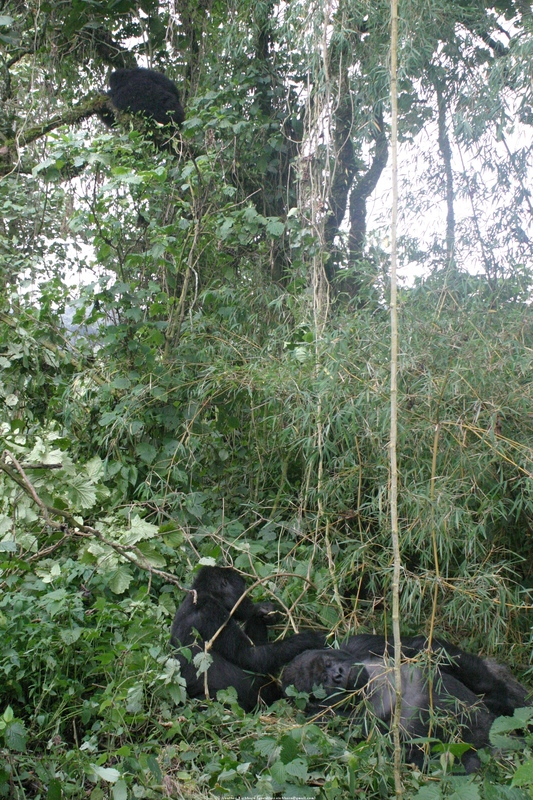 The next day was the big day in Rwanda, it was time to go Mountain Gorilla trekking. It was an awesome experience. The Eastern Mountain Gorilla (Gorilla beringei beringei, german: Berggorilla, french: Gorille des montagnes) are an extremely endangered species. It was humbling to be able to see them close-up and personal. Being only 3 m (10 ft) away from these magnificent creatures was a fantastic experience. In the afternoon I walked around Ruhengeri a bit. It is a nice, well developed town. It looked much better than for instance Narok in Kenya. Like everywhere, one main means of transportation is the motorcycle taxi. Overnight I stayed in the La Palme Hotel again. Both the Chimpanzees and the Gorillas were fantastic to see. If you plan on such a trip, make sure you visit the Chimpanzees first, then the Gorillas. While both are great to see, the Gorillas are much closer and more impressive, since they are more than likely on the ground. The Chimpanzees are more difficult to see and not quite as impressive since they are way up in the trees. If you would see the Gorillas first, the Chimpanzees would be a bit of a disappointment after the experience with the Gorillas. Rwanda seems to be a curious mixture of modern and developing worlds. Kigali is full of advertising for Internet and cell phones. It has modern day traffic and cars. But even in the city a lot of traffic is on foot. Outside of Kigali, there were lots of people walking on the road. Day or night, all the roads were full with people on foot. This was somewhat difficult at night, because there are no street lights anywhere, and the pedestrians and bicycles are not lighted, so they are difficult to see. My guide/driver was not as knowledgeable as the guides in Kenya and Tanzania. This was not much of a problem with this type of excursion, because for all the trekking I had separate local guides that were knowledgeable enough. Mike was one of those guides who answer any yes/no question by default with yes, to mask their lack of knowledge, and to please the client. This can be infuriating and meant that I had to change questions to require complete answers, instead of yes/no. I have noticed that during quite a few guided tours in various countries, especially if the English of the guide is not too good. Often they don't quite understand the question, and resort to the default "yes" answer. It was absolutely worth a visit. Seeing Chimpanzees and Gorillas in the wild is stunning and amazing. If you visit only Rwanda and want to also see other wildlife, there is the Akagera National Park in the eastern parts of Rwanda, which the typical savanna fauna and flora.